How in the heck did I miss these shoes and collection? 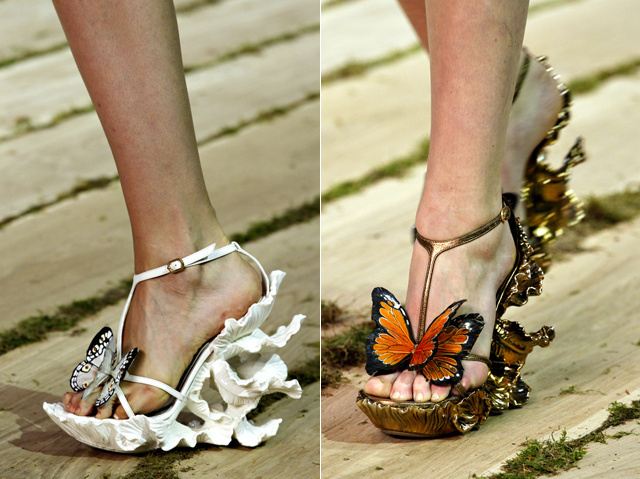 These gorgeous shoes are from the Alexander McQueen Spring/Summer 2011 Runway show held a few weeks ago. They are designed by Sarah Briton who took over for Alexander "Lee" McQueen after his tragic death last year. Aren't these shoes gorgeous? The detail is exquisite and the butterfly on the front just adds so much. Only question is, where would a normal person wear these to? I can not mention these shoes without mentioning that the dresses were unbelievable. Stunning, breathtaking, intriguing, gorgeous-just a few words to describe them. Sarah definitely started her reign of designing for Alexander McQueen with a very large bang. 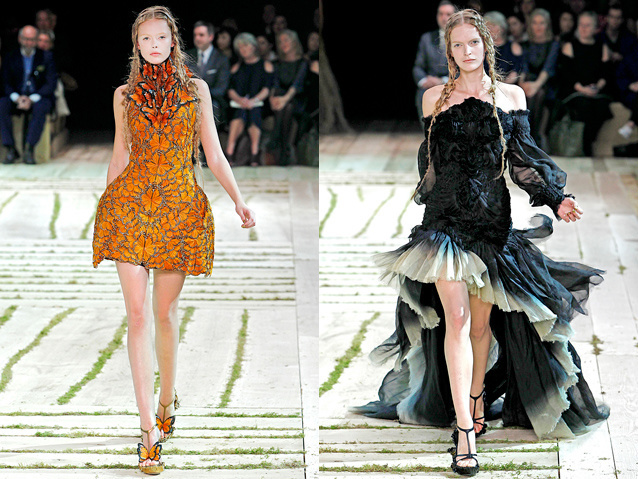 Here are two of my favorites-the orange dress is completely made with butterflies! Go to style.com or click HERE to see the whole collection. So what do you think? The detail in the dresses and shoes is so gorgeous, absolutely stunning. Alexander McQueen's loss was one of those things that can't be replaced. I could drop a tear just thinking back to that day. His legacy lives on and I hope his crew keeps his vision first. Great shoes! and I love those dresses!! !